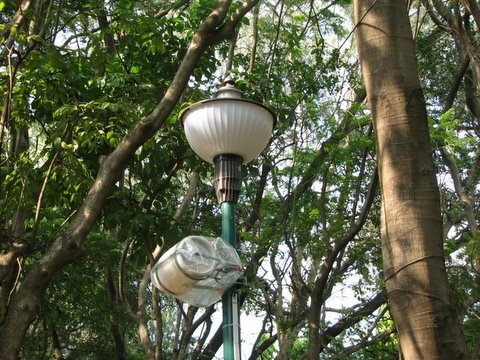 The Mini Forest in J P Nagar 3rd phase has a one-kilometre stretch of lovely trees, called the Mini Forest. This stretch is broken up into four parts, and it is intriguing that one part alone has been maintained very beautifully, with paved walkways, green grass, plants, communication boards, a playground corner, a yoga corner and so on. The other three parts have been left to their own devices. Still, having even one part looking so pretty was good…some of it was by neighbouring software companies, who are doing their bit for the environment. I thought, initially, that they must be solar charging panels, and went up to two men who were soldering it in place, what it was. “Speakers”, was the laconic reply. Now I am as fond of music as anyone else; but the idea of some devotional music or Radio Mirchi being played full-blast in the dawn of what should be a quiet morning does get my goat. There are, after all, plenty of walkers who listen to music on their iPods (or old-fashioned Walkmans! )…what is the need to bathe the entire park in waves of sound, early in the morning? Quite a lot of money seems to have been spent to get these speakers fixed to the light stands…and I cannot help wondering at the cost, and whether the initiative will be worth it…. This is such an important post. What is it about today’s people that makes them so intolerant to silence? Take away the TVs, laptops, and iPods, and most people with them wouldn’t know what to do with their life. The best moments of my life were spent holding hands and sitting down with the best person in my life listening to the chirping of birds. There is so much music in that…if people could only tune in. You know – in today’s insensitive urban Indian environment, it occasionally helps to …ahem – take matters into your own hands. I studiously rip off *every single* paper+plastic A4 sized advertisement stuck up on our residential area trees…you know, the ones that say "Taxi hire call (92222 00000)". Why don’t you, Deponti , simply dismantle the speakers along with a few other fellow morning walkers, and then deal with a Very Firm Hand with Whatever Happenes Next? Take the non-passive approach. Sometimes works, trust me. Try it! valid point Deponti esply on the cost part..
but what I would say is playing a soft music (devotional is 1 best thing) on a quiet morning is in fact good too. I’m a regular visitor to the BSK park very close to BDA on my morning walk and they have this custom of playing songs (Vishnu sahasra naamam and few other Kannada songs-kind of promoting Kannada language is what I could understand from the lyrics with the much lil kannada lang knowledge I have) at a reasonable low volume which stands soothing to the heart and mind. Janum…what if someone is an atheist, NOT inclined to music, and wants to walk in the park? What if someone wants to listen to some other music on hes iPod? Sound, like religion, can be a private thing today, and that’s the way it should be. One should have the choice of listening to music..or not. Taking away options from anyone is anti-democratic…that’s saying, "You will *have* to do this (in this case, listen to music." "Will have to" should be restricted to the legal rules, and not infringe upon other, more amorphous, areas…or at least, that’s what I think. BBMP likes spending money on such stuff. In the same BSK park, I found it so annoying when I was trying to take a walk one day. Why would someone want to listen to Radio Mirchi in a park ? And who is BBMP to tell us which music we should be listening to. Ridiculous. I can only hope that this has not been done in preparation of the upcoming election campaigns.